We are glad to be honored with "Silicon 70" award.Very thankful to our wonderful employees, our supporting customers, and partners for achieving this. 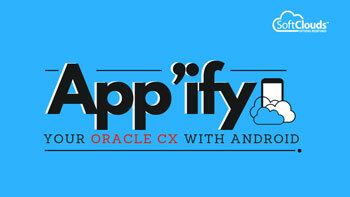 SoftClouds launches "App’ify your Oracle CX with Android" for Oracle OpenWorld 2018. We are proud to announce that SoftClouds has attained Oracle Platinum Partner status. A big thanks to our Customers, Partners, and the team at SoftClouds. We are very excited and look forward to continuing this wonderful relationship with Oracle. For the second time, SoftClouds is thrilled to join the prestigious Inc.5000 list for 2018 as one of the Fastest-Growing Private Companies in America. Thanks to our team, wonderful customers and our incredible partners without whom achieving this laurel would be impossible! Learn from SoftClouds experts on How to effectively use Artificial Intelligence. We are delighted to announce that SoftClouds was awarded the 100 Fastest Growing Private Companies in San Diego (2018) by the San Diego Business Journal. We got placed on the list of 100 organizations for sustaining a three-year (2015-2017) growth rate. On July 27, 2018, SoftClouds hosted its Annual Summer Mixer at the historic Del Mar Racetrack in beautiful San Diego. It was a great day witnessing the spectacle and thrills of the Racetrack. SoftClouds is hosting its Annual Summer Mixer at the historic Del Mar Racetrack in San Diego on July 27, 2018. Siebel CRM Grand Tour that happened on May 15, 2018, in Dallas, TX was a big hit! Thanks to all to the attendees and a big shout out to Oracle and SoftClouds team for the fantastic presentations and discussions. At the Modern Customer Experience held in Chicago, our CEO - Balaji Ramachandran was named a 2018 Oracle CX Hero. SoftClouds would like to Thank #OracleCX for such a fantastic recognition! Our CEO - Balaji Ramachandran gave a great presentation on "The Journey to the Cloud: SoftClouds Hybrid Cloud Integration Experience" at Oracle CX Automotive Council, Chicago during MCX from April 10-12, 2018. SoftClouds did a Siebel CRM Grand Tour on April 3, 2018 at the Irvine Oracle Office. CPQ solutions have evolved to become easy to use, easy to implement, and instrumental in achieving productivity. Here's how to find the right CPQ fit. SoftClouds did another tremendous training session on Knowledge Advanced at Oracle, Austin Office, on Feb 22nd, 2018. SoftClouds experts did an incredible training session on Oracle CPQ at Minneapolis on Feb 6th, 2018. SoftClouds experts did a training sessions on Configure-Price-Quote (CPQ) at the Oracle Santa Monica Office on Dec 13th, 2017. Proud to announce that our CEO, Balaji Ramachandran, has been awarded "The 10 Most Innovative Business Leaders to Watch" by Insights Success.